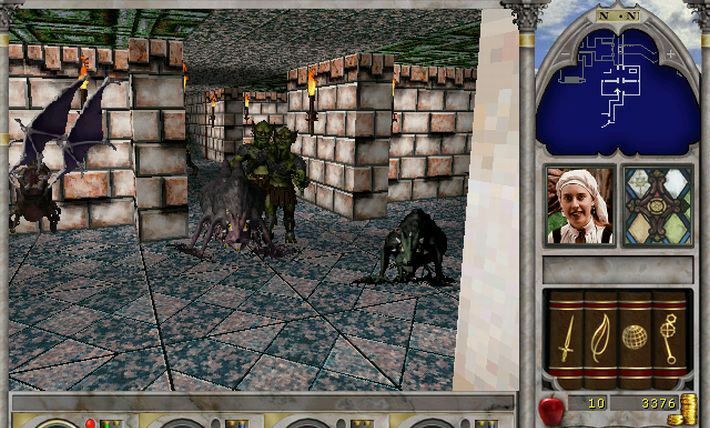 Have you played… Might & Magic VI: The Mandate of Heaven? It’s very difficult to pick a favourite moment out of the unsightly behemoth that was Might & Magic VI: The Mandate of Heaven. It may have been when I went on a murder-hobo rampage through the starting town of New Sorpigal, killing every peasant, every guard, every trader; and then heading to the temple and donating gold until my reputation had improved from “Notorious” back to “Respectable”. Or it may have been that fateful moment where, due to a simple misclick, I accidentally mixed one potion with another in my inventory and caused a chemical explosion that instantly killed my entire party. Mandate of Heaven remains to this day the only Might & Magic game I have played, so I can’t offer any comparisons to its prequels or sequels. What I can say is that it’s a surprisingly robust open-world RPG for its time, with a treasure trove of hilarious experiences scattered throughout its world. You see the world through the eyes of your party (though your party is treated as one entity with one set of eyes) and through this window you interact with NPCs, cast spells, and enter into combat with monsters and other enemies. Combat can be played in real-time or paused and played out in a turn-based format. It’s a tried-and-tested formula nowadays, but Might & Magic VI more or less perfected it back in 1998, offering meaningful character progression, multi-faceted combat, a fairly decent and in-depth storyline, numerous easter eggs, and incalculable anecdotes that all add up to feel like your journey, rather than the journey the game supplies for you. I can’t tell you how much time I’ve spent in the character creation menu at the start of this game, forging all-new stats and backstories for my characters, despite the fact that there were only something like ten preset portraits to choose from, so many of my parties ended up looking more or less the same each time. Ooh, no, wait. I think I’ve remembered my actual favourite moment. It was when I discovered a hidden Scroll of Flying embedded in the wall of that tower in the starting area, and then flew to the top of a building, otherwise unreachable, where I discovered a secret portal that teleported me to an end-game area on the other side of the continent, filled with about 50 dragons that incinerated me in an instant. Goddamn. I’m gonna go reinstall this game.